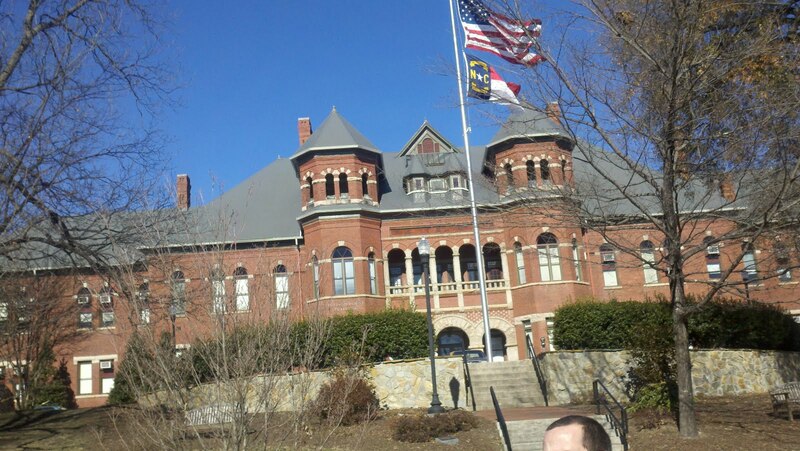 how elements of design are used at uncg. 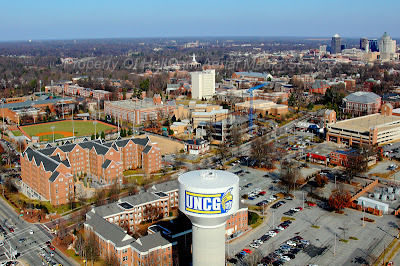 . .
to the uncg campus. . .
For me, the space at UNCG is divided to into 3 main sections: Learning, Pedistrian, and Parking. The learning portion spacially takes up the largest area, signifying it's importance in my hypothesis. 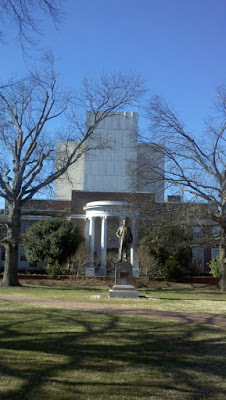 As the tallest building on campus, the Jackson library (background) subliminally tells the students that knowledge is power. Uncg sets a precedent in it's security features; it's relatively closed off from the rest of the city, well lit at night, and provides round the clock transportation for anyone feeling nervous about walking to their destination. The Foust building's site is set on top of a small hill, providing a sense of grandness as an experience to all those who walk in front of it. Adding to it's location is a great use of symmetry and order as design principals. Most buildings (if not all) used modern building techniques. Modern technology also fills most of the buildings, from nighttime securtity to lighting to computer labs. Generally speaking, the surface treatments of the buildings outside are pretty plain; brick, concrete, facia board. But inside the Witherspoon Art Museum, the sculptural treatment of this banded surface is more like a work of art. social networking in greece. . .
reading response 3: the greek temple. . . .
describing myself as a designer. . . .